I’ve worn a pedometer for several years, tracking my steps and being mindful to reach 10,000 steps per day (about 5 miles worth) more days than not during that time. Until last week, I’ve worn a simple pedometer attached to my belt that doesn’t do much but count steps and allow me to upload them to an online site via a USB port for tracking. With the advancement in wearable devices recently, I decided that I would get a Fitbit Flex wristband to wear. As good fortune would have it, I won one in a drawing at work the week before I intended to purchase one (thanks, Humana). Today marks the end of my first week wearing the Flex and I am so impressed and happy with it I want to spread the word. After receiving the package last Tuesday, the first task was to let it charge for an hour or two via the USB cable. That first charge lasted a full week. One of the beauties of the Flex is that it is a simple matter to plug in to your PC the USB dongle that allows the activity to be uploaded wirelessly and automatically any time you’re within 20 feet of the dongle. I just keep the dongle in the PC at all times so my steps are uploaded automatically numerous times a day as I walk by or sit at my desk. Registering at Fitbit.com and setting up some goals and personal preferences was quick and easy. For the past week I’ve worn both the Flex and my old pedometer so I could compare the results. I was alarmed after the first day when the Flex recorded nearly 16% fewer steps than the old pedometer. The idea of having to walk 16% more to get the same number of steps credited to my online rewards account with HumanaVitality did not appeal to me. Fortunately, though, as I wore it for the rest of the week, things evened out considerably due in part to the fact that you can wear the Flex 24×7 (including in the shower) while the other kind of pedometer necessarily has to come off at times. After 7 days and about 70,000 steps, there was only a total difference between the two of 34 steps with the Flex giving me those 34 more than the old pedometer. Beyond mere recording of steps, though, the Flex and the accompanying website has much to offer that makes using it a far superior experience compared to the other style pedometer. For example, it has a sleep mode you can place it in when going to bed that allows it to track your sleep nightly. When you get up and go to your computer or grab your smartphone, you’ll find how long it took you to fall asleep, how many hours and minutes you slept, how many times you woke up and when, how many times you were restless and when down to the minute. I let my wife wear it one night to track her sleep and we both agree it did an amazing, accurate job. There are a couple of sleep settings you can choose from based on whether you are a sensitive or normal sleeper. The normal setting seems accurate for my wife and me. It’s also nice having a silent vibrating alarm on the band you can set via the website. It woke me up each day with no problem and without my wife hearing anything (although my dog who sleeps by the bed or under my bed heard it just fine and came to make sure I was awake with a few wet kisses). The website dashboard is configurable in the panels it displays and can show steps per 15-minute time intervals, total steps, calories burned, distance traveled, very active minutes, sleep, weight, a gauge of calories in vs. calories burned (if you also log you food intake), how you stack up in activity over the past seven days with others you may friend on the site, plus Fitbit virtual badges earned for various accomplishments. I find myself checking the dashboard several times daily, either on the website or using the excellent smartphone app with the same detail. Customizable notifications via email or smartphone app. For example, I get an email when the battery is about 75% discharged so I have plenty of time to charge it and not lose any data. I got that reminder this morning after 6 days of use, wore it all day at work and then charged it when I got home this evening. Other notifications to my phone tell me when I am close to the goal I have set to help nudge me over the hump. Website notifications let you know where you stand among the people you have friended. There are two sizes of wristbands that come with the device, and the removable clasp works with either band. Multiple colors are also available. The site also syncs up with several other popular fitness sites to share data if you wish. The food logging option is easy to use and has encouraged me to start tracking calories and other nutritional information in far more detail than I ever have, and with very little effort on my part due to the large database of items that pop up as you start to type what you ate or drank. Even the simple way of logging water consumed during the day has made me more aware of how much I drink and how much more I should drink daily. While I haven’t had a need for it yet, the Fitbit customer service reputation is stellar. I have many coworkers with excellent customer service stories when, for example, they have lost or accidentally destroyed a device. Data is automatically uploaded to the site not only if you are near the USB dongle connected to a PC, but if you use the smartphone app and have Bluetooth enabled. This allows me to check stats real-time as I walk my dog or go for a jog, for example. There are multiple community forums on the website and the ability to create or join public groups. The ability to track flights of stairs you climb like another of their devices already does. A numeric readout on the band that shows the number of steps achieved for the day rather than a series of 5 lights that each represent 20% of your goal. A solid band that does not require a clasp. Although I’ve had no issue with the band coming off, I have heard of a few people at work who have lost a Flex because it came loose. Tweaks in its tracking ability for when users are doing things like pushing a stroller or grocery cart when it may not get enough movement to record anywhere near all the steps actually taken. A workaround is to use the larger band to place around your ankle for such times or maybe try it in your pocket. I haven’t experienced that issue, either, but have heard others at work complain about it. I thought perhaps I would experience it walking the dog and holding the leash with the hand wearing the band, fearing the more stable position of that hand might not record steps, but that was not the case. 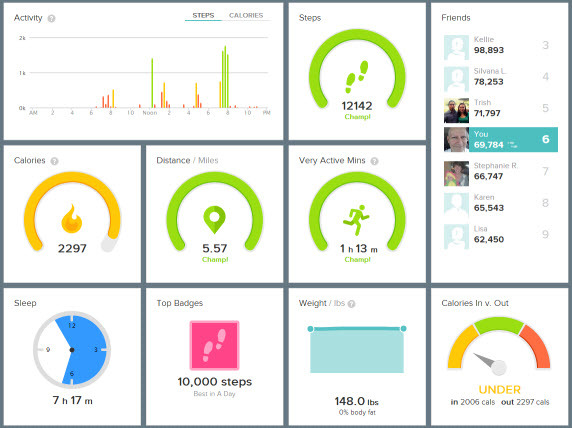 Overall, I am extremely pleased with the Fitbit Flex. In fact, I ordered one yesterday for my wife to wear. The retail cost is $99 and is well worth it in my opinion for the ease of use, the features available, the superb website dashboard, and the motivation it can help bring to the ongoing daily challenge of living a healthy lifestyle. If you’re curious to find out more, check out the website for it. They have other devices besides the Flex if you’re interested. If you’re a Fitbit user, feel free to friend me at Fitbit.com using my email address jeffkross@yahoo.com. If you’re a Fitbit user, I’d love to hear your story in a comment below. Thank you for this wonderful post and all the details on use! I don’t have one yet but it looks like a really great device. I appreciate all the graphs and tracking pics you posted. Are you still using it this year and getting consistent functionality? Yes, I’m still using it and loving it. So it my wife with the one I got her a few weeks after I got mine last year. It’s a great device and using the website along with it for tracking nutrition and sleep makes it even more valuable.